Acai bowls have become an obsession in our house. They are crazy easy to whip up, are packed with nutrients, and are crazy refreshing! Acai berries are a super food and are filled with antioxidants. Some studies show it can help with weight loss and has cancer fighting properties. A lot of times acai bowls are served with granola, fresh fruit such as pineapple, coconut, and honey. I included plain granola, pomegranate seeds, pumpkin seeds, and honey in this version. However you can mix it up and add other fruits, nuts, or types of granola. Think about flavors when you are choosing granola. A blueberry or coconut granola will go great with the acai, but a cinnamon flavor will probably not compliment the berries very well. I also use frozen banana when blending the acai. It stretches the acai a bit further and gives it some natural sweetness. This parfait is a nice layered version and it fits nicely in a glass rather than a bowl. It is a little easier to take on the go. However you are going to want to eat this right away! The acai tends to melt very quickly! This can turn into a smoothie before you know it! You can also add a layer of yogurt to this parfait to add a little protein to your breakfast! This is a perfect breakfast during the warm summer months, although I love eating them year round! It is also a perfect pregnancy breakfast. It is very palatable, refreshing, and gives a nice punch of nutrients. You can also add fresh spinach if you want to give this breakfast even more nutrients! Add the frozen acai, frozen banana, and orange juice to a blender. Blend on high and then reduce to low to create the smoothest texture. If it is too thick to blend add a little more juice. 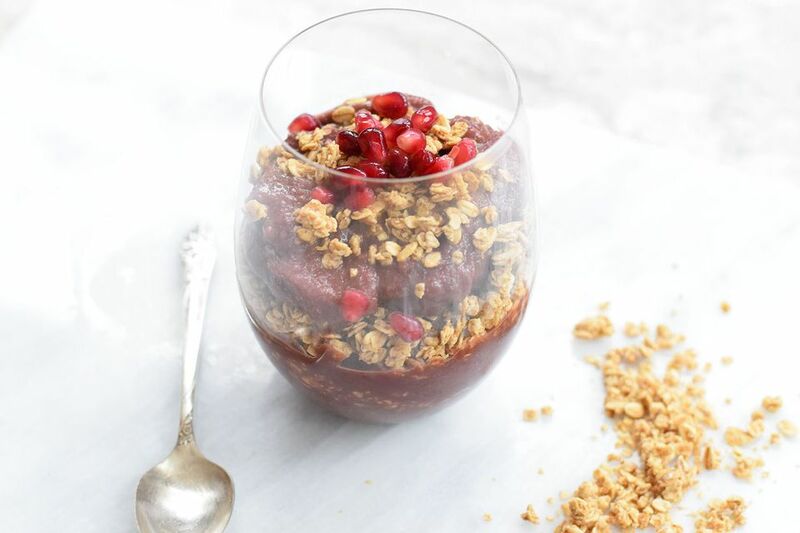 Grab a medium sized glass and scoop a third of the acai mixture into the bottom of the glass. Top with a third of the granola. Continue alternating with the remaining acai mixture and granola. Top the top of the parfait with the pumpkin seeds and pomegranate seeds. Drizzle with honey or maple syrup if you wish. Feel free to add other fruits or nuts if desired! Enjoy immediately, the acai will begin to melt very quickly!